Assess robustness of a GFP reporter construct in a range of environments. Successful advances in synthetic biology require development of precise and robust standards for measurements of parts and devices. Biological systems are extremely sensitive to cellular and environmental changes, therefore standardisation of gene expression is essential for reliable measurements. The lack of these standards presents a potential limitation to the development of Sensynova and other genetically engineered devices. To address this issue, we examined the variability found between identical genetically engineered devices under different environmental conditions and as a result of using different assembly standards. Gibson assembly proved to be the least time-consuming method to manually produce the synthetic GFP reporter gene compared to Golden Gate and BioBricks. The production of the GFP reporter construct using the Biobricks method was unsuccessful; the multiple steps involved, time consuming methodology and inefficient enzyme activities throughout this process lead to a limited number of parts that were able to be joined. Additionally, it was found that joining the smaller parts; the promoter and RBS was more challenging than joining the larger parts in the manual assembly. The Golden Gate assembly method successfully produced the GFP reporter construct, however it involved more steps and was more time consuming than Gibson assembly. A major limitation of this investigation was human error and a difference in user. The Gibson assembly construct had a higher GFP expression level after 24 hours, at 7.46x105 AFU/OD600 with the standard error of 6.51x104 AFU/OD600, compared to the Golden Gate assembly construct which had the final GFP expression level of 2.17x105 AFU/OD600 with the standard error of 6.68x104 AFU/OD600 (Figure 1). There was a significant difference in the GFP expression between the Golden Gate and Gibson Assembly constructs (Mann-Whitney, U=483, n=25.25, p<0.05). Figure 1 The mean expression levels of a synthetic GFP reporter gene, taken from 5 replicates, constructed by Gibson assembly and Golden Gate assembly in a TOP10 Escherichia coli chassis, measured as Arbitrary Fluorescence Units/OD600. The GFP expression levels were compared in LB media and measured every hour over a period of 24 hours. The GFP expression levels were compared to a synthetic GFP construct in an E. coli chassis as a positive control and a non-fluorescing E. coli device as a negative control. The E. coli cells were grown at a neutral pH over 24 hours, at 37ᵒC and 220 rpm. Error bars represent standard error. 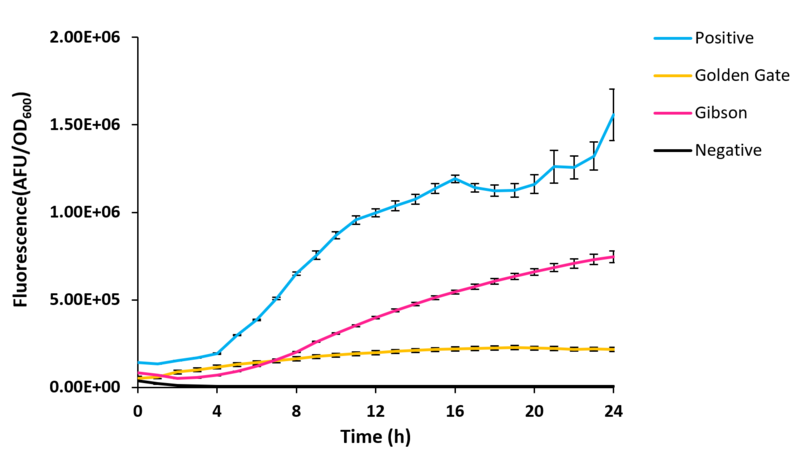 The 5-alpha strain containing the synthetic reporter construct which was grown in LB media, at 37ᵒC and a neutral pH, had a higher final GFP expression level, at 6.18x105 AFU/OD600 with the standard error of 1.69x105 AFU/OD600, compared to when grown in SOC media which was 4.08x104 AFU/OD600 with the standard error of 1.76x104 AFU/OD600 at 24 hours (Figure 2.1). There was a significant difference in 5-alpha GFP expression between LB media and SOC media over 24 hours (Mann-Whitney, U=854, n=25,25, p<0.001). 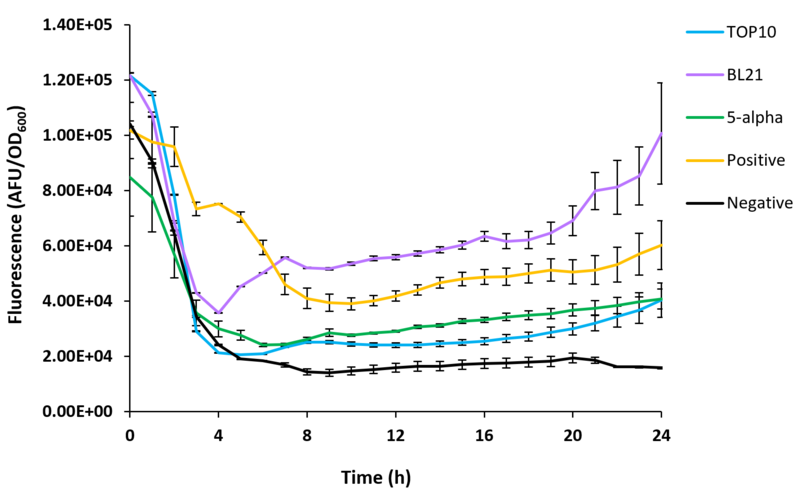 The GFP expression of the 5-alpha strains grown in both LB and SOC media decreased during the initial 4 hours of incubation, during the lag phase of growth followed by a substantial increase in expression in LB media over the remaining 20 hours and relatively constant expression level for the final 20 hours in SOC media. Figure 2.1 The mean expression levels of a synthetic GFP reporter gene construct, taken from 4 replicates, in a 5-alpha Escherichia coli chassis in LB media and SOC media, measured as Arbitrary Fluorescence Units/OD600. The GFP expression levels were measured every hour over a period of 24 hours. The GFP expression levels were compared to a synthetic GFP construct in an E. coli chassis as a positive control and a non-fluorescing E. coli device as a negative control. The E. coli cells were grown at a neutral pH over 24 hours, at 37ᵒC and 220 rpm. Error bars represent standard error. The GFP expression of 5-alpha grown at 31ᵒC in SOC media at a neutral pH was 1.68x105 AFU/OD600 with the standard error of 6.10x103 AFU/OD600 after 24 hours of incubation. This was higher than the GFP expression in the 5-alpha grown at 37ᵒC and 43ᵒC, which were 4.08x104 AFU/OD600 with the standard error of 7.13x103 AFU/OD600 and 3.94x104 AFU/OD600 with the standard error of 4.38x103 respectively (Figure 2.2). There was a significant difference in mean GFP expressions of 5-alpha between 31ᵒC, 37ᵒC and 43ᵒC in SOC media over the 24 hours (ANOVA, F2,72=12.10, p<0.001). A post hoc Tukey test indicated that there was no significant difference between the expression at 37ᵒC and 43ᵒC (p>0.05) but the expression and 31ᵒC was significantly different to the other temperatures (p<0.001). The Gibson Assembly construct in 5-alpha also had a higher GFP expression in LB media compared to SOC media during the stationary growth phase at 31ᵒC. Figure 2.2 The mean expression levels of a synthetic GFP reporter gene construct, taken from 4 replicates, in a 5-alpha Escherichia coli chassis at 31ᵒC, 37ᵒC and 43ᵒC, measured as Arbitrary Fluorescence Units/OD600. The GFP expression levels were measured every hour over a period of 24 hours. The GFP expression levels were compared to a synthetic GFP construct in an E. coli chassis as a positive control and a non-fluorescing E. coli device as a negative control. The E. coli cells were grown in SOC media at a neutral pH over 24 hours at 220 rpm. Error bars represent standard error. The 5-alpha E.coli containing the Gibson Assembly construct which was grown in 37ᵒC SOC media at pH 9 had a higher final GFP expression than the 5-alpha grown at pH 7 or pH 5; final the GFP expression of 5-alpha at pH 9 was 4.12x105 AFU/OD600 with the standard error of, 2.40x104 whereas the GFP expressions for 5-alpha grown at pH 7 and pH 5 were 4.08x104 AFU/OD600 with the standard error of 7.32x103 AFU/OD600 and 2.88x104 AFU/OD600 with the standard error of 4.27x103 AFU/OD600 respectively (Figure 2.3). There was a significant difference in mean GFP expression levels between 5-alpha grown at pH 5, 7 and 9 over the 24 hours (ANOVA, F2,72=49.88, p<0.001). A post hoc Tukey test indicated that there was no significant difference in the 5-alpha GFP expression between pH 5 and 7 (p>0.05) but 5-alpha at pH 9 had a significantly higher GFP expression than at the lower pHs (p<0.05). 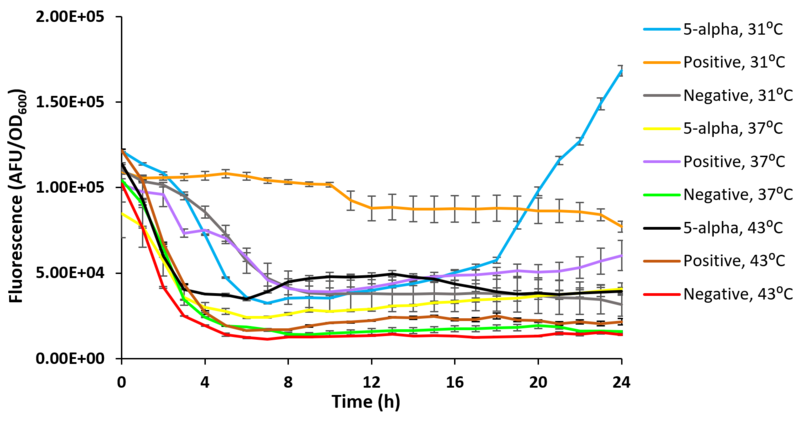 Additionally, the 5-alpha E. coli grown in 37ᵒC LB media had a higher GFP expression at pH 9 than the 5-alpha grown in pH 5 and pH 7 LB media; the GFP expression at pH 9 was 9.13x105 AFU/OD600 with the standard error of 3.45x104 AFU/OD600 whereas the GFP expression at pH 5 and 7 in LB media were 6.38x105 AFU/OD600 with the standard error of 2.49x104 AFU/OD600 and 6.18x105 AFU/OD600 with the standard error of 1.68x104 AFU/OD600 respectively. Figure 2.3The mean expression levels of a synthetic GFP reporter gene construct, taken from 4 replicates, in a 5-alpha Escherichia coli chassis at pH 5, pH 7 and pH 9, measured as Arbitrary Fluorescence Units/OD600. The GFP expression levels were measured every hour over a period of 24 hours. The GFP expression levels were compared to a synthetic GFP construct in an E. coli chassis as a positive control and a non-fluorescing E. coli device as a negative control. The E. coli cells were grown in SOC media over 24 hours, at 37ᵒC and 220 rpm. Error bars represent standard error. The BL21 E. coli strain containing the Gibson Assembly construct had a significantly higher GFP expression level than the 5-alpha and TOP10 strains when incubated in SOC media at 37ᵒC at a neutral pH; the BL21 GFP expression was 1.01x105 AFU/OD600 with the standard error of 3.66x104 AFU/OD600 at 24 hours whereas 5-α was 4.08x104 AFU/OD600 with the standard error of 7.32x103 AFU/OD600 and TOP10 was 4.04x104 AFU/OD600 with the standard error of 1.24x104 AFU/OD600 at 24 hours (Figure 2.4). There was a significant difference in mean GFP expression levels between 5-α, BL21 and TOP10 grown at 37ᵒC at a neutral pH in SOC media over the 24 hours (ANOVA, F2,72=15.16, p<0.001). A post hoc Tukey test indicated that there was no significant difference in the GFP expression between 5-α and TOP10 (p>0.05) but BL21 had a significantly higher GFP expression than the other strains (p<0.05). Figure 2.4The mean expression levels of a synthetic GFP reporter gene construct, taken from 4 replicates, in BL21, 5-α and TOP10 Escherichia coli chassis, measured as Arbitrary Fluorescence Units/OD600. The GFP expression levels were measured every hour over a period of 24 hours. The GFP expression levels were compared to a synthetic GFP construct in an E. coli chassis as a positive control and a non-fluorescing E. coli device as a negative control. The E. coli cells were grown in SOC media at a neutral pH over 24 hours, at 37ᵒC and 220 rpm. Error bars represent standard error. TOP10 E. coli grown at 43ᵒC, pH 7 in LB had the highest overall level of GFP expression at 1.31x106 AFU/OD600 with the standard error of 8.65x104 AFU/OD600 which was during the stationary phase of growth at 20 hours. The second highest overall level of GFP was expressed by BL21 at pH 9 in 37ᵒC SOC media at 1.27x106 AFU/OD600 with the standard error of 7.24x104 AFU/OD600. The results from this investigation confirmed that the presence of sequence scars within synthetic gene constructs have a negative impact on the expression of downstream products. Gibson assembly proved to be the optimum DNA assembly standard, producing a gene construct that had no sequence scars and had the highest expression of downstream products. It was additionally the simplest and least time-consuming manual assembly method. The optimum conditions for the expression of the GFP reporter gene were 31ᵒC LB growth media, at pH 9 using a BL21 E. coli chassis. However, there were some anomalies and unexplained outcomes from the different combinations of variables and these optimum conditions were found to differ from the optimum conditions for the growth of the E. coli chassis. This research provides the foundations for the development of automated, high-throughput methods of DNA assembly and characterisation of genetic circuits, which will lend itself to a wide range of beneficial applications. There are several competing standards for constructing DNA parts into circuits with various requirements and disadvantages but there has been relatively little previous research into the direct effects of different DNA assembly methods on the expression of genes. Therefore, these findings provide a valuable contribution to a plethora of future developments within the field of synthetic biology. Reporting accurate measurements is crucial, but can prove a challenge. Device operation is often measured against optical density, but this can be affected by various factors, such as the plasmid copy number and variable cell count. The Interlab study used standards such as Ludox and fluorescein, which help standardisation across various labs and instruments, but do not account for natural variation. In order to combat the difficulty of reporting measurements accurately, we decided to design an internal control featuring monomeric RFP. GFP tends to show a high Copy-Number Variation (CNV), and this combined with its unreliable cell count can render it a non-optimal fluorescence standard. In a study conducted by Kosuri et al. (2013), “GFP expression levels varied over approximately four orders of magnitude compared with relatively constant red fluorescence”. Copy number is affected by many factors, such as culture conditions, the ori, the size of the plasmid, the growth rate, etc. In the absence of selection, high-copy number plasmids are typically lost from populations at a high rate, making plasmid loss a key factor in limiting accurate measurements. RFP’s high, constant levels of brightness, a relatively low number of base-pairs, and availability of multiple assays to measure its fluorescence such as spectrophotometry and microscopic assays, make it a viable choice for an internal control. By integrating a monomeric RFP reporter into the current iGEM Interlab plasmids, it is hypothesized that a better alternative to Ludox and fluorescein can be found in RFP. A comparison of fluorescence versus OD measurements across multiple plates of both interlab plasmids as well as plasmids with the proposed internal control, should indicate the reliability of the RFP unit as a standard. BBa_K2205000 is a proposed composite BioBrick reporter that constitutively produces MFRP1 (Figure 3.1). 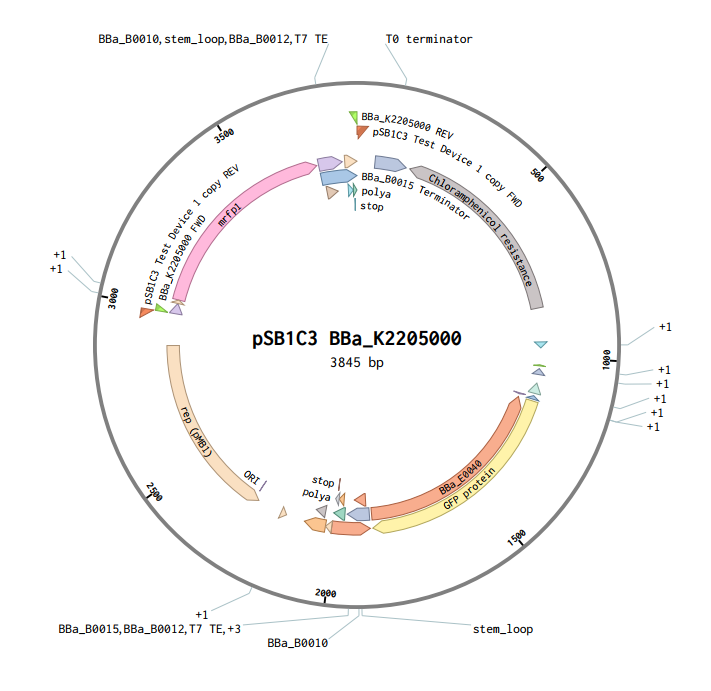 It possesses an MRFP1 coding sequence (E1010) after a strong Anderson promoter (J23100) and RBS (B0034). A double terminator (B0015) was added after the MRFP1 sequence. A BioBrick RFC10 prefix and suffix were added as well. Three twins were discovered after submission to the Registry. The construct was submitted to IDT for synthesis as a gBlock. Due to time constraints, work on assembling and further characterising this Biobrick was unable to finish. Future work could be conducted by further characterising this part and acquiring OD and fluorescence values on a plate reader of an assembled interlab plasmid against interlab devices without an internal control. Ideally, the RFP should maintain constant levels of fluorescence regardless of cell count and copy numbers across all plates, and provide an internal standard for comparison against GFP fluorescence. This addition could extensively improve variation issues encountered in the InterLab Study. Kosuri, S., Goodman, D. B., Cambray, G., Mutalik, V. K., Gao, Y., Arkin, A. P., Endy, D., and Church, G. M., (2013) Composability of regulatory sequences controlling transcription and translation in Escherichia coli. Proc Natl Acad Sci U S A 110, 14024-9. Lin-Chao S, Bremer H. 1986. Effect of the bacterial growth rate on replication control of plasmid pBR322 in Escherichia coli. Mol Gen Genet. 203(1):143–9. Imanaka T. 1987. Some factors affecting the copy number of specific plasmids in Bacillus species. Ann N Y Acad Sci. 506:371-83. Review. PubMed PMID: 3324859.